Our Portuguese driver to the airport gave us a short language class on the way. He taught us basics – hello, goodbye, please, thank you, and the like so we could be friendly. When he suggested a few swears or insults we told him no bar fights were planned and settled for the universal “shut up”. The four and a half hour flight from Boston took us to the main island of Sao Miguel. With the time change, we arrived early AM. 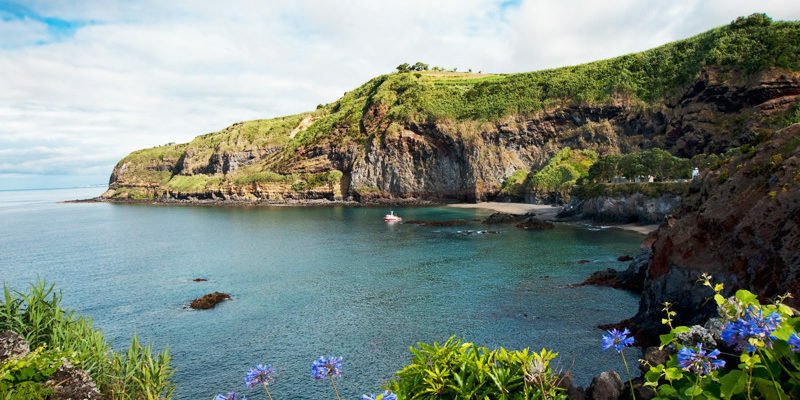 Sao Miguel, which is 5 miles wide by 45 miles long, has a lush, green, jungle-like terrain with exotic flowers that can be seen from the tops of volcanic mountains down to the blue ocean. Everywhere we went, I was amazed by the abundance of brilliant hydrangea bushes planted as hedges. Our 4-star hotel was downtown and across from the ocean in the capital city of Ponte Delgado. A local guide took us on a walking tour to help us get our bearings. We were able to check out the nearby shops, restaurants, and open-air markets. There were also several museums, a park, and an active military fort, yes, they have an army. We also visited two unique churches, St. Michael’s and St. Peter’s, one with gold inlaid walls and statues and the other all hand-carved wood. Unfortunately, cameras were not allowed. We enjoyed a fresh and delicious breakfast buffet at the hotel every morning during our stay there. The evening meals at various restaurants were also excellent and featured dishes new to me – carrot cream soup – chicken with mustard sauce – sea bass with sautéed veggies – forkbeard fillet with ratatouille – to name a few and now my mouth is watering. Most of the food in the Azores is made from scratch with no chemicals or additives, not even salt. Beef, veal, and chicken are raised free-range or grass-fed; milk is unpasteurized, fish is fresh every day and pesticide free fruits and vegetables are the norm and in season. The Portuguese take great pride in their food and this was proven again when we lunched at a cozido feast. To see this traditional stew cooked, we visited the Valley of Furnas where hot springs and boiling sulfur pools are used to cook cozido in underground silos. These silos are only big enough to hold a very large pot. The food is layered – first cabbage, kale and yams; then chicken, beef and rib steak; next peeled carrots, sweet potatoes, and white potatoes. The top layer consists of pork belly, blood sausage wrapped in cabbage leaves, and chorizo. Finally, everything is covered with the kale and cabbage leaves. The lid is put on and the pot is buried and left to cook by volcanic steam for 7-8 hours. When done, the food is transported to a nearby restaurant where we helped ourselves from huge platters balanced by waiters. Delicious does not adequately describe this meal. Did we do anything other than eat? Only for the exercise. Each day we headed to a different part of the island. One area we visited was an extinct volcanic crater that became twin lagoons, one blue and one green, the most photographed site in the Azores. We frequented quaint villages with 15th-century architecture and picturesque marinas. We learned the workings of a ceramic factory and were shown the difficult, lengthy growing process in a pineapple plantation, a staple of the Island. There was a liquor factory that insisted you try before you buy, one after another and another. After that, we welcomed the tea factory visit with aspirin in hand. We oohed and aahed over colorful gardens and waterfalls, and even had the option of swimming in a geothermal pool with a sulfuric aroma. There were high mountains with herds of cows grazing on the steep slopes. I couldn’t help thinking “How do the cows keep from rolling down?” Then there was the cruise around the island. Did I mention how full our days were? 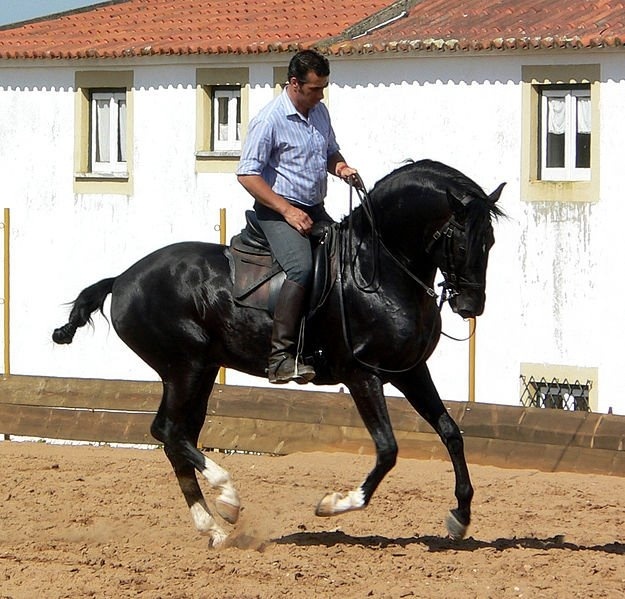 On our last day, we visited a privately owned 75-acre farm for a fabulous lunch along with an impressive dressage demonstration of the amazing Lusitano horses. Afterward, the gracious owners and their sons patiently answered our many questions on the breeding and training of these magnificent animals. The farm was a slice of heaven with mountains on one side and the ocean on the other. 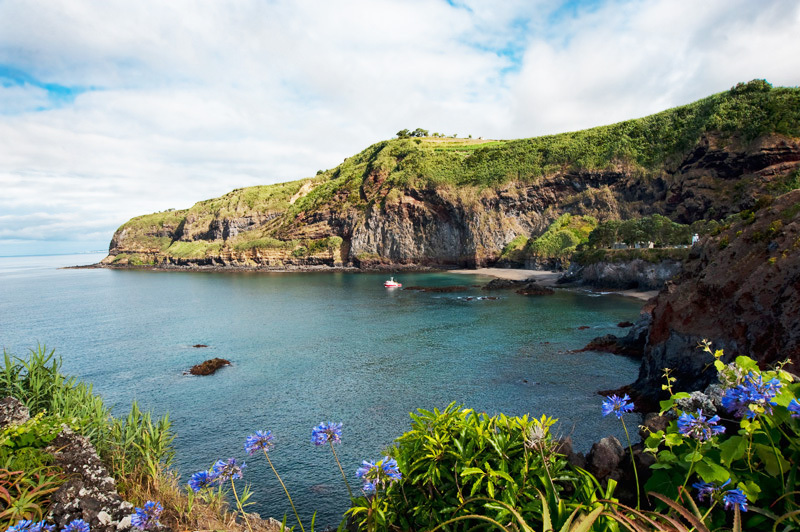 I loved everything about the Azores and now I know the answer to “Where is this place”?